If it’s time to replace the windows on your home, don’t put off this important investment for another second. Instead, contact the pros at Majors Home Improvement to learn how our home window replacement services outperform the other guys. We have been serving homeowners throughout the Destin, Florida, area since our founding in 1997 and during that time, we have earned numerous accolades, including an A+ rating with the Better Business Bureau and a five-star rating with GuildQuality. Our installation team adheres to strict customer service guidelines, including maintaining a clean jobsite, working efficiently, and taking care to not disturb your landscaping. We offer a double lifetime warranty on your windows, protecting both the materials and the labor. We’ll be in constant communication with you from beginning to end, providing regular updates about the status of your project through emails or phone calls. While outstanding customer service is a very important aspect when it comes to choosing a home window replacement company, it’s also critical that the windows they install are top of the line. With Majors, you can count on that. 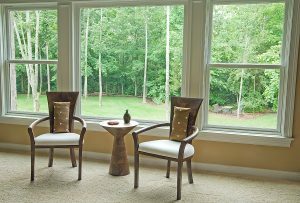 We install our Majors Select™ Vinyl Windows that are energy efficient and durable. Additionally, our windows come in various styles, frame colors, interior wood-grain finishes, hardware options, and grid and glass designs, allowing you to select the design options that suit your preferences exactly. Contact Majors Home Improvement today to schedule a complimentary consultation at your home in the Destin, FL, area. We’re pleased to be the home window replacement company of choice for homeowners in the region.